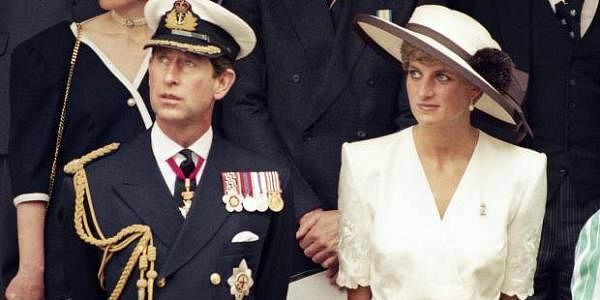 LONDON: Princess Diana said her honeymoon with Prince Charles was a "perfect opportunity" to catch up on sleep, according to a letter the British royal wrote to her personal secretary in 1981. The letter is included in a rare batch of correspondence between Diana and the Royal household which is set to be auctioned in Gloucestershire next month. Charles' marriage with Diana was doomed from the start as letters sent by the Princess reveal she spent her honeymoon "catching up on sleep", The Telegraph reported. Writing to her personal secretary Jane Parsons, Diana wrote, "The honeymoon was a perfect opportunity to catch up on sleep...." The couple married at St Paul's Cathedral in July 1981, before separating 11 years later in 1992 and finally divorcing in 1996. Diana was fatally injured in a car crash on August 31, 1997, in the Pont de l'Alma road tunnel in Paris. The letter in which she talks about her honeymoon is written on Royal Yacht Britannia crested paper and is dated August 15, 1981. The 25 lots up for auction include a typed list of wedding gifts, dried flowers from the Princess's wedding bouquet, letters written during the couple's honeymoon on the Royal Yacht Britannia, and following the birth of Prince William, as well as thank you letters, Christmas cards, photographs and invitations to numerous Royal events. A typed tally of correspondence received after the birth of Prince William includes details of 4,500 baby presents and records that 24,000 thank you letters were sent out by ladies in waiting. Letters to "everyone in the office" give thanks for her 21st birthday present and record her "gratitude at having such a wonderful collection of people looking after us". The Princess also hopes the staff are not left "exhausted, overworked and underpaid" after the birth of the new baby prince. Thanking Parsons and other staff for the gift of a silver photo frame, the Princess says, "Recently I seem to have endless pictures of William, so it's lovely to think I'll be able to frame one of them for our bedroom." 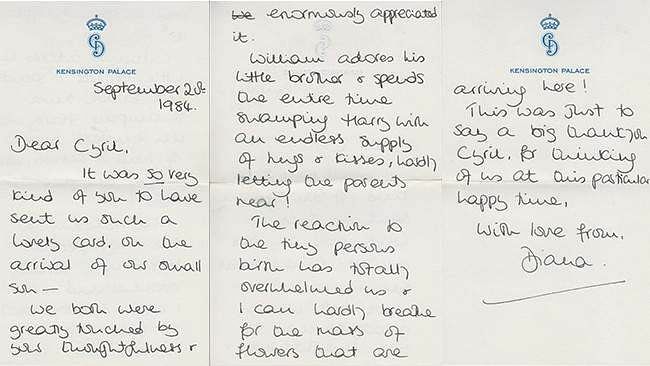 A letter on Kensington Palace crested paper dated July 5, 1983, shows how pleased Princess Diana was to see her young son when she returned from the Royal tour of Australia.